Thoughts of a Viking: Skyr! 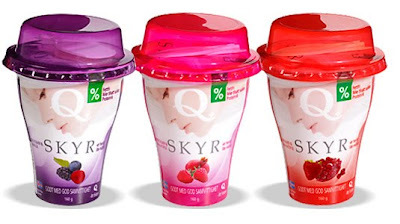 How trendy does this sound to you exactly: A fat-free icelandic yoghurt-cheese, full of protein with no added sugar, fully recycleable packaging and fabulous for smoothies. I think it is missing soy- and maybe a fairtrade or ecological stamp on it, to be honest. But then, it is viking traditional cuisine, meant to make you healthy and strong - not gay. It is nice to stick to the basics, really. But I tried this deliciously funky Icelandic treat today, with added fruits of the forest and vanilla. I think I would've preferred it half as sweet, because one portion later, I actually felt a little queasy. Probably because this particuar type was made with both aspartame and acesulfame K, which are artifical sweeteners. I insist that I can tell when it's not just normal sugar, but I don't think I really can. except if it gets too sweet, if you know what I mean. Supernaturally sweet. Anyway, Skyr was extremely rich and creamy, like a divine concotion of cream cheese and really mild greek yoghurt. A texture to die for, melt-in-your-mouth - soft like clouds, an absolute surprise from the "low-fat" packaging. I mean, I just bought it for the name, and the purple colour, of course. But I really enjoyed it, a very (if not a little sweet) satisfying lunch, probably stunning with cereal, some fresh fruit, raisins, you name it! Yum! I would love to have some traditional Icelandic skyr, seeing this is a Norwegian brand. Blomst! Vi må lage mat sammen snart! jeg har sånn namnam oppskrift på tyrkisk youghurtdessert! Jeg vil gjerne ha en sånn en i presang.